When writing about GIS geometry I'm unsure whether to use the term "polygon" or "area". In particular, does the word "polygon" suggest a specific type of geometry? For example, a colleague suggested to me that "polygon" is not an appropriate term for a donut feature! But even if that's true, does anyone care? Is there any strong concensus either way on this? Also, which word translates better into other languages such as German and French? I'm trying to consider users other than just English-speaking ones. OGC defines standards for geometry types. Among others there is the "Polygon" type and a polygon is a "Surface". OGC defines "area" as the measure of the "surface". "Area" to me suggests the actual area measure of the polygon feature. "Polygon" is fine for German-speaking audience too. @"Donut Polygon": A Google image search suggests that "donut polygon" is commonly used. "Donut Area" doesn't turn up any related images on the first page. Polygon is a shape (geometry) - Like hexagon - but has area and length. I like to use the google map features etc, but have never thought about the name of the map area inside the map. I have just always called them polygon maps, and that is that. Although most shapes that I use to create my ''polygon'' map is shaped differently, they are still just polygon maps. In the google refernce section, the map they create as a "area map" is referrred to as a polygon map. I agree with all the comments "saying polygon is the geometry, area is the measurement". Also note that as in a recent GISse post, software specific terminolgy sometimes (often) plays part. ESRI calls these "donut polygons" - multi polygons. There is also more to it than just the bounding coordinates, and the measurement of the area. As noted in the linked document (McGranaghan), some polygons can be 3d objects, with a polyface mesh. Oracle does a pretty good job of keeping it simple. As noted in the linked document other software (RDBMS) can get tricky. It should also be noted that Oracle is on the track with OGC ISO standards however not as SDO. Not the answer you're looking for? Browse other questions tagged geometry internationalization or ask your own question. 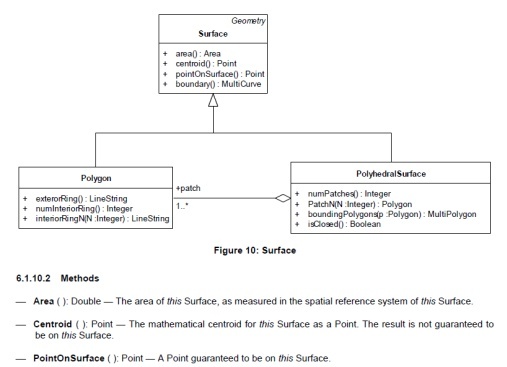 Any .NET library to calculate polygon area? How to find the smallest-area ellipse circumscribing a convex polygon?